A mourner stands outside the Hudson home in the Englewood neighborhood. The .45 caliber gun found in an abandoned lot on the West Side a block away from where the body of Jennifer Hudson’s 7-year-old nephew was discovered is the same caliber as the weapon used in the two murders at the Hudson home, police officials said. On Monday, a private service will be held for Hudson’s mother, brother, and nephew at 9 a.m. at Apostolic Church of God, 6320 S. Dorchester Ave.
Chicago Bears defensive tackle Tommie Harris, a friend of Hudson, has been asked by a family friend to donate a football jersey in memorial of Hudson’s brother, Jason. 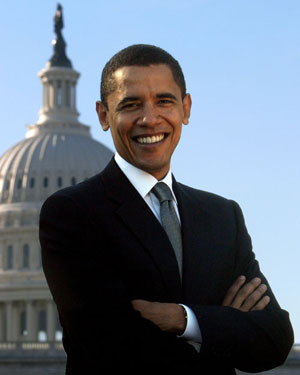 Mayor Richard Daley predicts one million people will attend the Sen. Barack Obama rally set for election night in Grant Park. Tickets are already sold out for the event. Supporters are scouring the internet looking for tickets on sites such as Craigslist and Ebay with very little avail, according to the Tribune. A waiting list has formed at www.democrats.org/electionnight. The Chicago Park District will allow vendors to sell pizza, hot dogs, and hot chocolate. Alcohol sales are prohibited. To accommodate the expected crowds, CTA and Metra will be adding extra buses and trains in the afternoon and evening. The gun used in the Hudson family murders was found in an abandoned lot on the West Side. 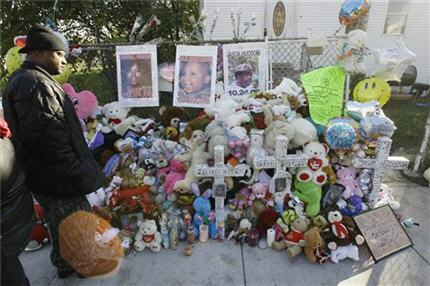 The gun was located not far from where the body of 7-year-old Julian King, nephew of Jennifer Hudson, was discovered. Police officials now believe that more than one person was involved in the murders. Hudson’s brother-in-law, William Balfour, has been named a person of interest by the police and is currently in jail for a parole violation. He was convicted in 1999 for attempted murder and vehicular hijacking. A hearing on Balfour’s parole violation case is scheduled for Nov. 10. Last night, Balfour’s mother Michele, was on CNN’s Nancy Grace Show proclaiming her son’s innocence. 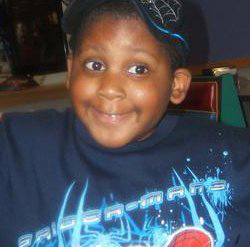 Julian King, 7-year-old nephew of Jennifer Hudson. Jennifer Hudson is offering a $100,000 reward for the return of her 7-year-old nephew Julian King. Hudson’s sister, Julia pleaded for her son’s live outside the family’s church, Pleasant Gift Missionary Baptist Church on the South Side. William Balfour, Jennifer Hudson’s brother-in-law, is now in police custody but has not been charged for the double murders yet. Sen. Barack Obama released a statement offering the Hudson family his condolences. Obama hand picked Hudson to sing the national anthem at the Democratic National Convention this summer. Chicago Mayor Richard Daley and Rev. Jesse Jackson also offered their condolences to the Hudson family. 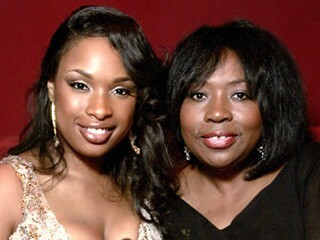 Jennifer Hudson and her mother at the Academy Awards. The mother and brother of Oscar winner Jennifer Hudson were found dead in their Englewood home. An amber alert has been issued for her 8-year-old nephew. Her brother-in-law is considered a suspect. The Chicago native is said to be rushing back to town from vacationing in Tampa, Fla. with her fiancé David “Punk” Otunga from the reality show I Love New York 2. Hudson had been riding high with the recent release of The Secret Life of Bees, her first movie since Dreamgirls, which she won an Academy Award. She also released her self entitled debut album in September. This is such a terrible tragedy. Please keep her and her family in your prayers. 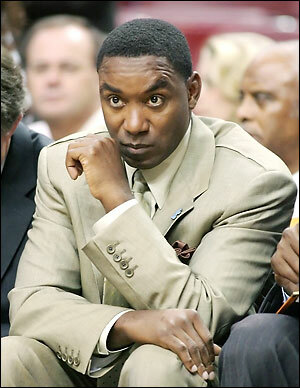 Chicago native and former New York Knicks coach and president Isiah Thomas overdosed on sleeping pills today. Thomas told the New York Post that it was not him but his 17-year-old daughter who needed medical treatment for hypoglycemia. But police officials confirmed to the Post that it was indeed Thomas who required medical treatment and not his daughter. Hmm… I am sure more news will come out about this one. This blog will focus on African American entertainment. Readers will be informed of events and activities in the Chicago area. Entertainment news about local and national celebrities will also be featured. Copyright © 2019 Suite 411. All rights reserved.